Socotra, part of the Republic of Yemen, is a small archipelago of four islands in the Arabian Sea off the Horn of Africa. Socotra’s isolation from the mainland combined with a tropical desert to semi-desert climate has lead to unique speciation, with more than a third of its plant life being found nowhere else on Earth. The islands contains a wide range of habitats: beaches, mountain ranges, plains and caves. Because of Socotra’s broad diversity it has been described as the strangest-looking place on Earth. 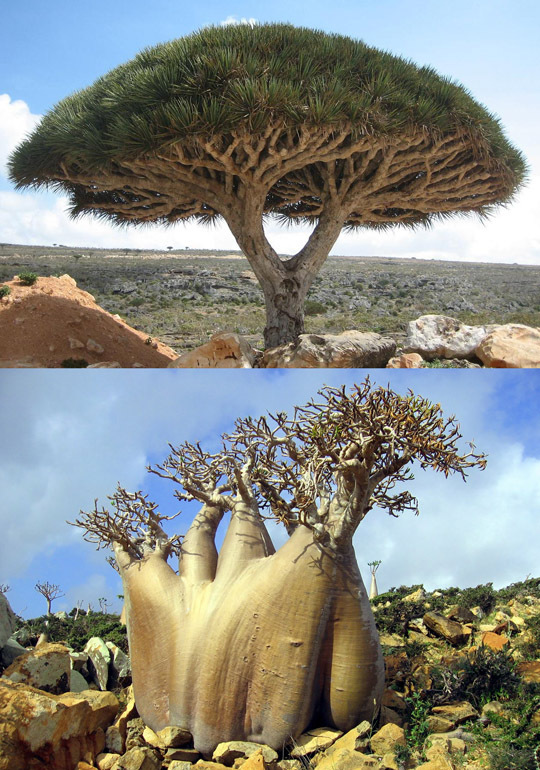 The dragon blood tree (above) and the cucumber tree (below). One of the most impressive of Socotra’s plants is the dragon blood tree (Dracaena cinnabari), which looks very odd with an umbrella shape. Its red sap was thought to be the dragon’s blood of the ancients, sought after as a medicine and a dye since antiquity and highly prized by European Renaissance painters. It was also used as a varnish by 18th century Italian violin makers. The unusual shape of the dragon blood tree is an adaptation for survival in the dry rocky soil where it is found. The large, packed crown furnishes shade and reduces evaporation which helps seedlings survive beneath the adult tree. Perhaps the strangest of all the trees on Socotra is the cucumber tree (Dendrosicyos socotranus), which looks like a giant cucumber with its bulbous trunk and tiny crown. It lives on the dry parts of the islands up to about 500 meters in elevation. It is the only tree in its plant family which includes melons, gourds, squashes, and yes, cucumbers. Cucumber tree seedlings are eaten by goats that graze on the islands. Mature trees are often cut down and made into pulp which is fed to livestock. The leaves of the cucumber tree are used by the local population to treat a variety of ailments. Socotra’s ecosystem is one of the most endangered in the world and it is listed as a World Heritage Site by the United Nations Educational, Scientific and Cultural Organization (UNESCO). Both the dragon blood tree and the cucumber tree are considered vulnerable species by the International Union for Conservation of Nature (IUCN).